Negotiating as a seller in NYC is more of an art than a science. Being a successful negotiator requires strong interpersonal skills, creativity and the ability to listen and adapt. Initial offers are usually meant to be a starting point for negotiation. As a general rule of thumb, most buyers are willing to negotiate up to the midpoint of their original offer and your asking price. If you run the numbers and the midpoint is within range of an acceptable deal price, you should offer a counter to the buyer. You can even offer sale comps to your buyer as a means of justifying your counter. If the midpoint is simply too low, you should ask the buyer to provide a few sale comps which justify his or her offer. Confused About Closing Costs? Estimate your seller closing costs in NYC using Hauseit’s interactive Seller Closing Cost Calculator for NYC. Just remember, a buyer always likes to leave room to improve his or her offer. In some cases, a buyer might even be willing to go higher than the midpoint during the course of a negotiation. 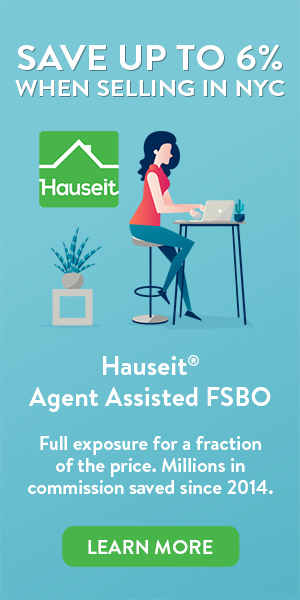 The worst thing you can do as an Agent Assisted FSBO seller is to prematurely burn bridges with buyers by responding rudely to low offers or refusing to counter offers which are meant to be starting points. If a starting offer is too low, you’re likely correct that there is only a remote chance of the deal coming to fruition. But some chance is greater than no chance. When an offer is too low, hop on the phone with the buyer or buyer agent and ask questions. Step into the shoes of the buyer and try to figure out his or her perspective and justification for the offer. What comps are being used using to support the offer? Is there another reason why the offer is low? Perhaps the offer is all cash and non-contingent, which makes it more valuable than an offer for which the buyer is taking out a mortgage. 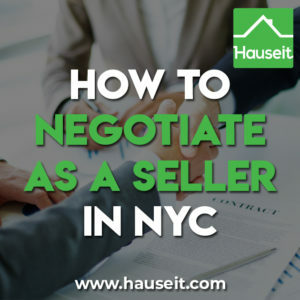 Being a strong communicator and resisting the temptation to take things personally will give you the highest chance of success as a seller in NYC. Just remember: there’s always upside in being civil to people, building rapport and listening to your counterparty. Negotiating a sale price ultimately comes down to the comps and your willingness to sell. The best way to try and make a deal happen is to ask your buyer to support his or her offer by providing relevant sale comps. How Much Are Buyer Closing Costs in NYC? Estimate your seller closing costs in NYC using Hauseit’s interactive Buyer Closing Cost Calculator for NYC. However, there are times when a buyer’s offer may be attractive to you even if the offer price is below what’s supported by the comps. If you are desperate to sell or you’ve mismanaged the sale process, you may be willing to accept an offer which is below market. It’s important to approach the sale process in a prudent manner so that you don’t find yourself in a compromising position once you receive an offer. Listing with an unrealistic price, not bothering to pursue all leads, being combative with buyer agents and using amateur photos are all potential ways to end up with a high ‘days on market’ and look vulnerable to buyers. The proposed deal price is obviously the most important element of any negotiation. However, it’s not the only lever you can pull to try and make a deal happen. If a buyer won’t budge on price, you may want to consider leveraging other deal terms to try and bridge the gap on pricing. Is your buyer financing the purchase and requesting a mortgage contingency? Are you concerned about a low appraisal? If so, you can negotiate specific appraisal contingency language which would cover some or all of your downside if the appraisal comes in low. Are you concerned about a buyer’s finances and worried that they won’t receive a mortgage commitment letter? If so, you can negotiate the length of the mortgage contingency period. You can learn more about common contingencies in NYC real estate here. Do you need to temporarily remain in your home after closing? If so, you can negotiate a post-closing possession agreement with your buyer. The most commonly negotiated terms of a New York City post-closing possession agreement include the length of post-possession occupancy, the cost of the post-closing occupancy, the escrow amount as well as the holdover fee. Are there any current or future assessments? You can offer to cover some or all of any assessments as part of your negotiation with a prospective buyer. Do you have any nice furniture, such as custom built-ins or a TV or fancy multimedia system? Because these possessions are often costly to move, you may want to consider using these as deal sweeteners so you can entice a buyer to improve his or her offer price. A real estate contract deposit of 10% is the market standard in New York City. However, you can negotiate this if circumstances warrant it. As the owner, you shouldn’t be blamed for having an emotional attachment to the home you’re trying to sell. After all, it’s your money on the line and you bought the home for a reason. However, being unable to detach yourself emotionally from your home can have catastrophic consequences during a negotiation. If your emotional attachment inflates your perceived value of the property, it will make it impossible for you to counter offers appropriately. The fundamental way to minimize emotional attachment is to start your sale process by prepare a robust and honest Comparative Market Analysis. Be honest with yourself: why do you think your home is worth more or less than recently sold homes? Write down your justifications and then review them with a more emotionally detached friend or family member. Having a true sense for what your home is worth will allow you to respond to offers in a productive and realistic manner. If the value in your head is unrealistic, you’ll end up turning away qualified buyers whose offers are in line with the market. If you do this too many times, you’ll end up with a high day count on your listing and be forced to reduce your asking price anyway, possibly somewhere below the level of the offers you received previously. Taking things personally during a negotiation is a one-way ticket to failure. This is because buying and selling real estate is nothing more than a business transaction. Since your own money is on the line, it’s understandable that you’ll be more emotional compared to a buyer’s agent. However, exposing yourself emotionally can break down your lines of communication with your counterparty and reduce the likelihood of a deal happening. As a seller, you will encounter many types of personalities in buyers and buyer’s agents. Some buyers may be friendly and perhaps too talkative, while other buyer brokers will give you the stone-cold treatment. Taking personal offense to a buyer’s negotiation strategy is completely counterproductive and won’t give you a fighting chance of doing a deal. In an ideal world, the buyer of your home has a heart of gold and you become lifelong friends with them after the deal. While this does happen from time to time, it’s not an outcome you should rely on. Ultimately, New York City real estate is business. And business is business. Email is both a valuable tool as well as a dangerous and counterproductive trap in a negotiation. While negotiating is multidimensional, emails are two dimensional. If you are relaying a complicated or difficult message to your counterparty, the best approach is to pick up the phone. Speaking over the phone instead of sending emails allows you to listen in for clues or intel about the buyer’s motives and willingness to improve his or her offer. This intelligence will give you the upper hand when negotiating. For example, would you have learned that your buyer is doing a 1031 exchange and desperate to buy ASAP if you had just been emailing back and forth? Perhaps you can show less flexibility in your counter offer once you know that the buyer is in a time crunch. What Is the Cheapest Way to Sell a House? Does a Seller Have to Respond to My Offer in NYC?